From an old manuscript of Paulus Richius. 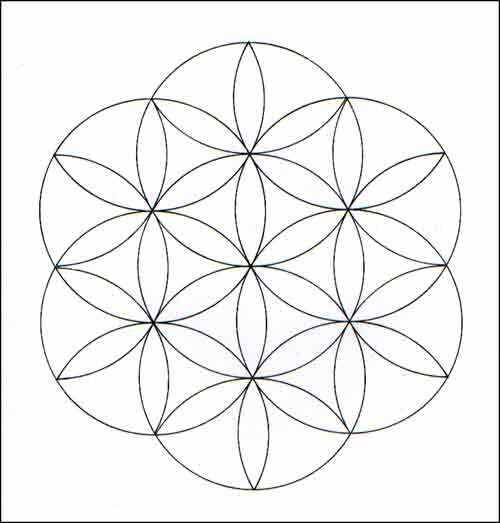 This diagram contains ten circles representing the Sephiroth (singular: Sephirah); that is, the “spheres,” “numbers,” or “emanations”. The Sephiroth are the numbers 1 through 10 considered in their archetypal sense. 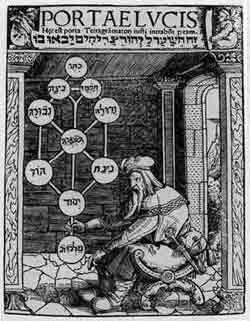 Each Sephirah is an archetypal idea. Also, the Sephiroth represent emanations from God and describe the process of creation. In the material world, they represent the heavenly spheres according to the classical conception. I always wondered why the Kabalistic Tree of Life has the shape it has. 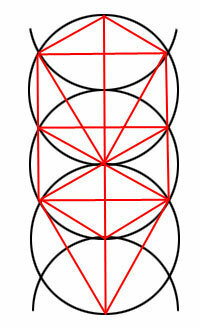 It has an unusual shape; how did the Cabalists decide to use such a shape? 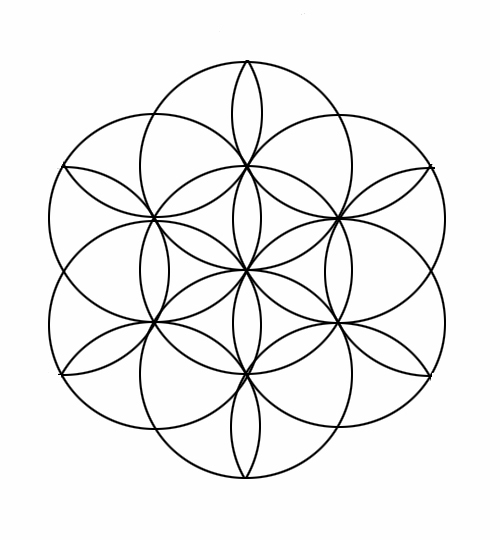 One day I discovered that it is drawn in interlocking circles. 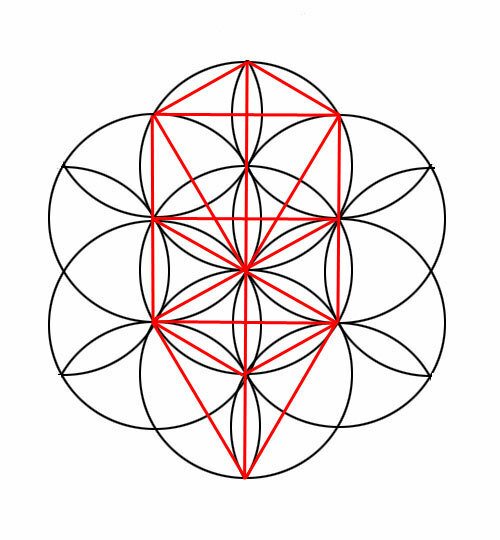 Why interlocking circles? Well, they are the product of a mathematical genesis. Let me explain. First there is the Nothing. The Ain, or Ain-Soph, the great limitless Nothingness of which nothing can be said. Then a point arises out of the Ain-Soph. God brings forth the immensity of eternal extension. With our limited human understanding we call this “non-existence”. God withdraws himself from himself and creates an emptiness and a place for the Ain-Soph. The next thing is a circle. It encompasses the entire created emptiness. It is like the extension off the point. From this duality arises. There the point and the circle, the male and the female, the positive and the negative. This simple act brings forth a lot of interesting things. 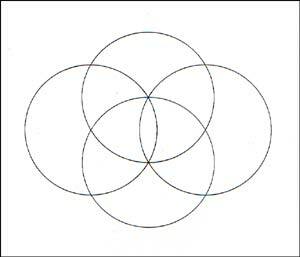 The overlapping area is a “Vesica Pisces”, a symbol used in early Christian days for Christ. 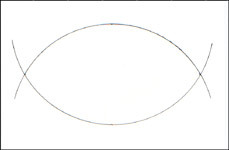 The almost oval shape is also a universal symbol for the yoni, the female sexual organ used by many cultures for the Great Mother. It is well known in Eastern religions, but Mother Mary in the Catholic Church was also frequently depicted with the same symbol behind or around her. From unity we went to duality to quaternity. The Four Elements are a quaternity as it is said that they are interrelated, they cannot exist without one another. They come forth out of unity and they dissolve into unity. The Four Elements are the foundation out of which the entire universe is built. 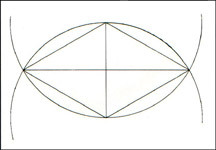 The diamond shape is related to the number four and quaternity, but it brings forth the triangle within, and thus trinity, and the cross which produces a fifth point. So we have the numbers 3, 4 and 5, and this is the mathematical expression of the right triangle having 30°, 60° and 90° angles, of which the legs are 3 and 4, and the hypotenuse 5. It is the only triangle of which the hypotenuse will be a whole number when the legs are whole numbers too. 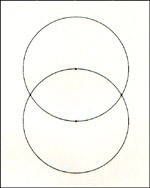 Besides the point and the circle, the third geometric structure is the line. And there are three lines of different length. 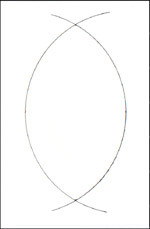 The radius of the circle is r (the vertical axis of the diamond). 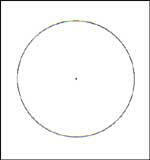 The distance of the center point of the ‘ellipse’ or diamond to the circle is r/2. 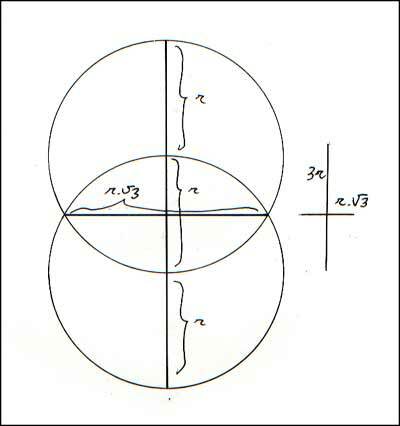 The distance of the same center point to the point where the the two circles cross is (r/2)X√3 (radius divided by two and multiplied by the square root of 3). √3 is the first square root to appear. When measuring the simple distance of the above we obtain (r/2)X√3, or the total length of the long axis of the diamond is rX√3. 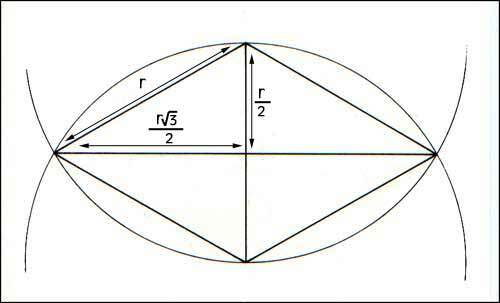 But when we calculate the relation of the long axis of the diamond to the short axis of the diamond (the cross), we obtain the pure square root of three: rX√3/r = √3. 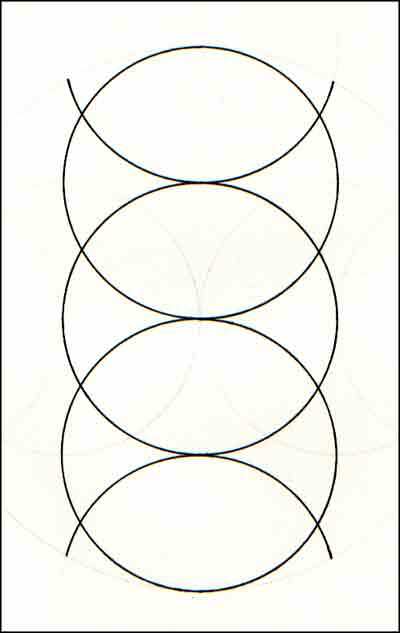 When we duplicate the circle three more times, we obtain the thirteen points on the circles of which actually ten are attributed to the Sephiroth (sometimes one more for Daath, the ‘hidden’ Sephiroth). One wonders why they left out the two lower ones. Are there more hidden Sephiroth? we will go into this in the following chapters.